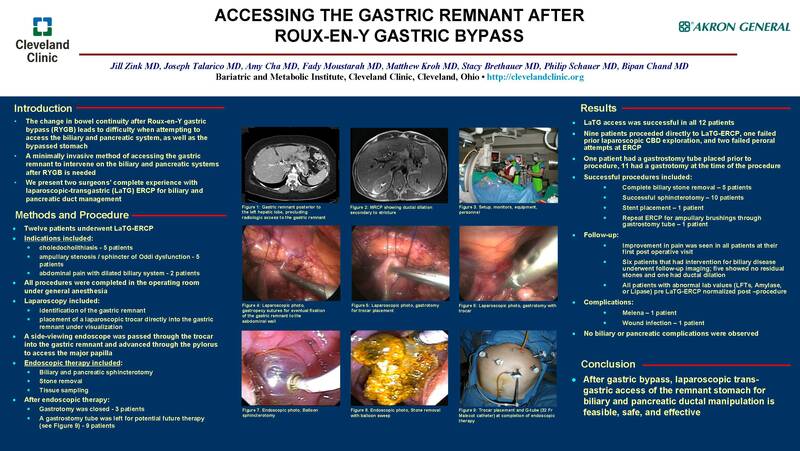 INTRODUCTION: A minimally invasive method for accessing the gastric remnant to intervene on the biliary and pancreatic system after Roux-en-Y gastric bypass (RYGB) has not been well described. This is a retrospective review describing two surgeons’ complete experience with laparoscopic trans-gastric (LaTG) ERCP for biliary and pancreatic duct management. METHODS AND PROCEDURES: Twelve patients underwent LaTG-ERCP. Indications included choledocholithiasis (5 patients), ampullary stenosis / sphincter of Oddi dysfunction (5 patients), and abdominal pain with dilated biliary system (2 patients). All procedures were completed in the operating room under general anesthesia. Laparoscopy included identification of the gastric remnant and placement of a laparoscopic trocar directly into the gastric remnant under visualization. A side-viewing endoscope was passed through the trocar into the gastric remnant and advanced through the pylorus to access the major papilla. Endoscopic therapy including biliary and pancreatic sphincterotomy, stone removal, and tissue sampling was then conducted. After endoscopic therapy, the gastrostomy was either closed or a gastrostomy tube was placed for potential future therapy. RESULTS: Laparoscopic assisted transgastric access was successful in all 12 patients. Nine patients proceeded directly to LaTG-ERCP, one failed prior laparoscopic CBD exploration, and two failed peroral attempts at ERCP. Endoscopic therapy was successful in all 12 patients. Complete biliary stone removal was successful in five patients. Patients with sphincter dysfunction or dilated biliary or pancreatic ducts had sphincterotomy in 6 cases and stent placement in one. Six patients that had intervention for biliary disease underwent follow-up imaging; five showed no residual stones and one had ductal dilation. All patients with abnormal lab values (LFTs, Amylase, or Lipase) pre LaTG-ERCP showed normalization post –procedure. Improvement in pain was seen in all patients at their first post operative visit. Complications included one patient with melena and one with wound infection. None had biliary or pancreatic complications. CONCLUSIONS: After gastric bypass, laparoscopic trans-gastric access of the remnant stomach for biliary and pancreatic ductal manipulation is feasible, safe, and effective.